It is not surprising that many people are confused about worming. There is no one plan that is suitable for every yard and best practice for worm control in horses, ponies and donkeys has changed over the years to a more targeted approach – worming only when necessary, with a suitable product, at a suitable time. All horses continuously experience some level of gastrointestinal parasitism (i.e. worm burdens) throughout their lives. It is now known that a low level of parasitism actually has some health benefits, particularly on the immune-system. High worm burdens, however, can cause a number of symptoms including weight loss (or lack of weight gain), loss of appetite, poor performance, colic, diarrhoea and, in some severe cases, can even lead to death. Traditional worming regimes have previously consisted of worming horses every 6-8 weeks, regardless of their parasite burden. A blanket approach tends to lead to many horses being treated unnecessarily, costing more, polluting the environment and, very importantly, increasing the chances of wormer resistance (so the worming products do not effectively kill the worms). Targeted worming involves using faecal worm egg counts to determine whether or not your horse actually needs worming. his approach typically reduces wormer use by 70-80%, saving you money, reducing wormer resistance and is better for the environment. A faecal worm egg count is a simple, widely available, procedure and is performed cheaply and quickly. A small sample of fresh faeces is all that is required. Ideally this should be taken from three different areas of fresh faeces and mixed to make a total amount about the size of a golf ball. The sample should be submitted as fresh as possible (it is possible to refrigerate it for several days if it cannot be submitted within 24 hours). Your vet will be able to advise on which product to use on the basis of the worm egg count, taking into account your horse’s specific situation. Some horses will repeatedly have higher worm egg counts than their field companions even if they are managed in exactly the same way and does not necessarily reflect an underlying problem. Faecal worm egg counts do have their limitations. Firstly they give no indication of the level of encysted cyathostomins, when redworm larvae “hibernate” in the gut wall. For this reason, it is often recommended to use moxidectin (found in Equest and Equest Pramox) in the autumn or early winter. Secondly faecal worm egg counts do not reliably give any indication of tapeworm burden. A blood test for tapeworm antibodies is available, but will remain high for several months even if the tapeworms have been killed. Therefore most horses should receive a tapeworm wormer (praziqauntel or double dose pyrantel) once or twice a year, depending on their risk. This is often combined with the autumn wormer for encysted redworms and the only product on the market that does this is Equest Pramox. Worm egg counts are usually repeated 3 – 4 times a year, depending on the results and which worming product was used (e.g. pyrantel does not last as long as ivermectin). Pasture management is key to controlling gastrointestinal parasitism. The faeces should be removed from the pasture (“poo-pick”) at least twice a week (ideally every couple of days). It is also useful to graze sheep on the pasture as they “hoover-up” the horse parasites and there is no overlap of sheep and horse worms. Horses should not be moved onto clean pasture within 2 weeks of worming. This “dose and move” strategy used to be recommended but this significantly increases the chances of introducing resistance worms on the new pasture. Some horses on very well managed pastures may repeatedly have very low worm egg counts. 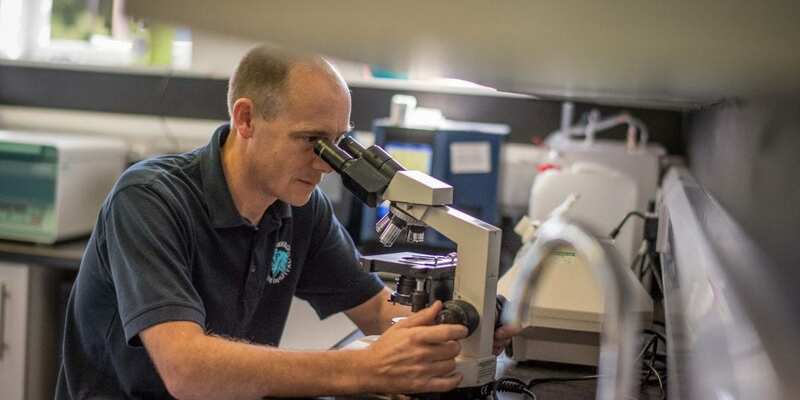 In these cases the frequency of worm egg count testing may be reduced to 1-2 times a year and a tapeworm blood test may be considered instead of using a tapeworm wormer. Conversely a stud farm may require more intensive management, as young stock are more susceptible to cyathostomin infection (redworms) as well as worms such as Strongyloides westeri and Parascaris equorum. There is no one plan that will suit all horses and yards. Advice on worming can be confusing and the number of worming products can be bewildering. Experts are agreed that the traditional approach of worming is misguided and dangerous. A targeted plan based on faecal worm egg counts should be used and your vet will be able to give tailored advice taking into account a number of factors, including previous worm control measures, pasture management, horse movements, horse ages, weather conditions and any known resistance problem.